ALDI has now received full planning permission for a 1,278 sq.m. store at the entrance to the park and will add to the already impressive line up of TK Maxx, Harvey Norman, Homebase, Argos Extra, DID Electrical, Harry Corry, Carpetright, Halfords, KFC and Opel all of which are open and trading very successfully. A planning permission has also been granted to add a further 2,800 sq.m. of retail warehousing that will sit immediately adjacent to Aldi and Harvey Norman. Peter Levins of Bannon has confirmed that 2 new tenants have been secured to take 700sq.m. units each. He hopes to announce their names shortly. Quoting rents are in the region of €237 per sq.m. In addition, planning permission is granted for and terms have been agreed for a new coffee shop facing onto the Donore Road. This will add considerably to the retail mix in the retail park and provide customers with a chance to meet and rest their feet. 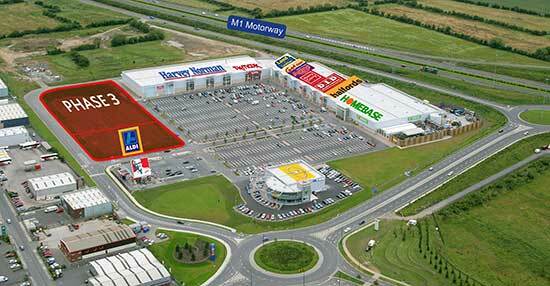 The retail park is strategically located at one of the most important intersections along the M1 benefitting superb profile onto the motorway as well as being within a 3 minute drive of the centre of Drogheda via the Donore Road. Drogheda is enjoying massive population growth which is estimated to almost double from 35,000 to 60,000 people by 2016.The town also benefits from the increasing population from the surrounding hinterland including Balbriggan, Bettystown, Julianstown, etc. For further information contact Philip Ryan or Peter Levins in Bannon on 01 6477900.